A monument commemorates 100 years of European discovery. The monument contains a bas relief of William Lawson. 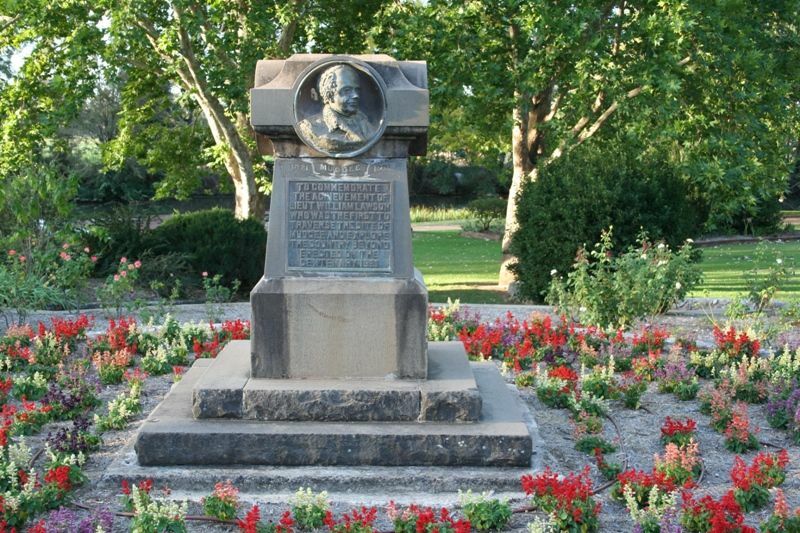 It also pays tribute to James Blackman, Superintendent of Bathurst who traced the course of the Cudgewong River and pioneer settlers John Blackman, William Lee, Richard Lewis, Tom Frome, George and Henry Cox. William Lawson, who had failed in an earlier attempt, travelled north to Mudgee where he found some excellent grazing land. Lawson had been a member of the first European party to cross the Blue Mountains in 1813 and was then commandant of Bathurst. He later took up 6000 acres along the Cudgegong River. He was immediately followed by George and Henry Cox (sons of William Cox who built the first road over the Blue Mountains) who became the first permanent European settlers on the Cudgegong River when they established the 'Menah' run, 3 kilometres m north-west of the present townsite. It was here that the first settlement developed. "MEMORIAL UNVEILED. TRIBUTE TO PIONEERS. (FROM OUR SPECIAL REPORTER.) MUDGEE, Thursday. 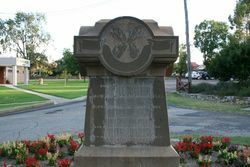 Mudgee to-day was the rendezvous not only of thousands of show visitors, but of those who wished to see the street pageant at the unveiling of a monument in honour of the pioneers. Before the procession went by the main streets were nearly as congested as George-street, Sydney, on a week day. 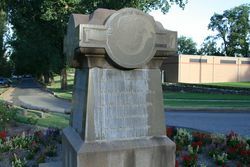 This memorial, which has been erected in Mudgee in honour of Lieutenant William Lawson (explorer), James and John Blackman, and George and Henry Cox (pioneers of the district), was unveiled by Mr K R. Cramp, president of the Historical Society. This function was the most important of the centenary celebrations. A platform had been erected a short distance from the obelisk and round this there gathered scores of white haired pioneers, some bent with age, some supporting themselves on sticks, or on the arms of friends, but all intent upon hearing as best they could the life story and achievements of a man whose fame and intrepidity were perhaps better known to them than to the multitude. Mr Cramp said that in erecting a memorial to one of our great explorers the citizens had performed a threefold service. They were paying an honour long overdue to the pioneers, fostering a spirit of hero worship - in itself an ennobling influence much underrated in Australia - and creating an interest in the past, thereby helping to develop and give direction to an Australian sentiment and tradition. The story of one's own country should have an attraction for every citizen. 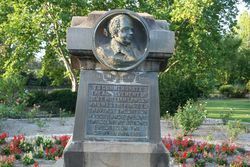 "And now that Mudgee enthrones Lawson and Blackman, explorers, and George and Henry Cox, its pioneers, I trust that the memory of Captain Charles Stuart and Sir Thomas Mitchell will be similarly honoured by towns further west," said Mr Cramp. "All honour to these pioneers, who rank in merit with the Pilgrim Fathers of America". He sketched the career of Lieut. William Lawson, and recalled his close historical association with William Charles Wentworth, whom Mr Cramp described as Australia's greatest patriot. These two, with Gregory Blaxland as leader, immortallised themselves, he said, when they crossed the barrier which for a quarter of a century had kept the little community cramped and confined on the narrow coastal fringe of the State. 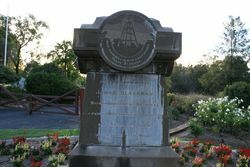 Alluding to a controversy as to whom should be given the credit of having first discovered Mudgee, he said he accepted the statement that Blackman discovered the Cudgegong River and the Mudgee district, but was barred from actually reaching the site of the township by a dense mass of reeds, and that therefore Lawson was in all probability the first actually to traverse the site. The controversy emphasised the need for the preservation of old records, journals, and letters, and the recollections of the pioneers. A combined choir under the direction of Mr R J Loneragan sang two verses of an anthem entitled "Hail, Pioneers," composed by Mr C. D. Smith, organising secretary of the centenary celebrations. The town band played "Australia for Ever," and the ceremony, which was witnessed by 5000 people, concluded with cheerlng for Lawson and the pioneers. Among those on the platform were Mr V. D. Cox, president of the centenary celebrations, Senator Cox, Mr Fleming, M. P., Mr Ashford, M.L.A. , Mr Aubrey Halloran of the Royal Historical Society, Mr R. D. Bawden, the mayors of Mudgee and Cudgegong, and Mr. D. B. Acton, of Sydney, who supplied and erected the obelisk.